PDCA vs. OODA — Why not take both? One of Boyd’s great achievements was to demonstrate that by using the principles we call “maneuver warfare,” one could harmonize all levels of war, from the tactical through the grand strategic (see Patterns, 141-144). Attrition warfare, by contrast, can certainly win wars, but it has a nasty habit of losing the peace. But business is not war, and it isn’t immediately clear what terms like “tactical” and “strategic” might mean for businesses or whether thinking in such terms helps businesses survive and grow. In this guest post, my friend and colleague Dean Lenane takes on this question and, in the best tradition of John Boyd, tests his answer in the marketplace. I had the privilege of working with Dr. W. Edwards Deming during the early 1980’s when he was reintroduced to the American business environment. Deming had of course become something of a celebrity due to his identification with the success of Japanese automotive juggernaut, which was making life difficult for the American automobile manufacturers by producing well equipped, high quality vehicles at very reasonable prices. Teams of “experts” were sent to Japan to determine how the Japanese had managed this miracle and one of the things that they brought back was a newly re-minted Dr. Deming. Deming was consulted and cosseted and sent for by many companies, one of which was Ford. Here, I was introduced to the man as he was employed by Ford to go and sort out the quality systems of some of the major suppliers to Ford. One of these targeted companies was United Technologies Automotive, where I was employed as a quality and reliability engineer. Deming proved to be one of the most important influences in my professional life, and to this day I use some of the techniques and learning tools that I acquired from the master himself. However there was a problem with Dr. Deming and his methods. The good doctor was brusque and intolerant of fools and this made him unpopular with American manufacturing managers. He would bore in using a very astringent version of the Socratic Method and expose errors of thought and approach in managers of all stripes and levels. After a couple of sessions with Dr. Deming, most of the more highly placed leaders in the companies he was visiting would wish never to see him again. Deming believed that American management was a chief source of the problems in American manufacturing and many of those managers were not happy to hear that they were the main problem. But some of the good doctor’s lessons stuck, and by far the most important and the most successful of these is the P-D-C-A, or Plan-Do-Check-Act cycle. This simple but effective tool has been used with great success by organizations, particularly manufacturing organizations, all over the world. I consider the P-D-C-A cycle or “loop” if you will, to be a primary tool for driving organizational fitness. One of the underlying, and often neglected lessons which Deming taught us was economy. Deming was very concerned with getting the most out of a system and using inferential statistics as a guide and a measurement system to achieve this. The P-D-C-A loop provided both a data source and a yardstick to show how we were doing at “driving out waste”. Using Deming’s systems, embracing his 14 points and seven deadly diseases, and using the P-D-C-A cycle as one of the primary data collection and analysis tools will make your organization a fitter, more efficient, and much more competitive organism. By recognizing the power of people, which was another of Dr. Deming’s major preoccupations, you will unleash their potential and you will have a happy ship, which is usually a good fighting ship. So now we come to Colonel John Boyd. I stumbled upon Boyd in around the end of the year 2000. I had been sent by a relatively small German company called CRH to run a newly established North American division. Upon taking this job, I immediately knew that our competitors were vastly larger than we were and were able to crush us at will if we were stupid enough to stand still long enough for them to get a good fix on our position. CRH was around $400 million in annual turnover and our competitors were companies that operated in the 12 to 17 billion-dollar range. I began to look for historical precedents where smaller organizations had beaten much larger organizations so that I could identify what, if any, were the organizational and managerial consistencies between smaller organizations that had been able to best larger ones. Anyone who starts down this road of inquiry will rather quickly run into Colonel John Boyd. John Boyd was one of the most important strategic thinkers produced by the United States since Alfred Thayer Mahan. Indeed it could be argued that Mahan and Boyd provide the strategic bookends for the 20th century. Boyd started out as a fighter pilot and famously issued a standing wager to all comers that from an even start, he could gain a position at their “six” in 40 seconds or less and thus be in a position to shoot them down. He never lost. As Boyd moved on in his career, he began to focus on what kind of aircraft would give its pilot an advantage in a dogfight. Out of this work he developed “energy-maneuverability” theories and tools which allowed him to describe and then to design, aircraft that could transition from one type of maneuver to another with a minimum loss of energy and momentum. The lower the loss of energy and momentum, the quicker the aircraft’s recovery and its ability to be redirected into a new and altered set of circumstances. This premise then began to inform a huge body of work that is primarily concerned with documenting and explaining the necessity of creating organizations that are very sensitive to the environment, that are extremely cognizant of unfolding circumstances in that environment, and which can adapt in a fast and agile manner to those circumstances as they change. Boyd used what he called the O-O-D-A loop, or Observe, Orient, Decide, Act loop to describe how an individual or an organization should react to changes in circumstances and take new actions as quickly as possible. If, Boyd’s theory states, you are able to turn a decision loop faster than your opponent and keep turning such a decision loop over and over again as the situation changes, you will gain an incremental advantage over your opponent that will eventually reduce him or her or it to a blubbering mass of confusion that is only sure of one thing, the inevitability of defeat. As Boyd’s great collaborator and promulgator, Dr. Chet Richards has pointed out, anybody who doesn’t believe this should play chess against an opponent who can make two moves to his one and see how long the game lasts. Boyd provided an intellectual proof for his theories in several fabulous presentations in which he would show how there are patterns in conflicts of various natures and how we can profit by studying these patterns and designing organization that are able to adapt faster than the other guy. The similarities between Deming and Boyd were striking. But as they were often similar they were also different. Some people who are familiar with the canon of both of these men’s work, often fall into the error of seeing the O-O-D-A loop as a function of the P-D-C-A loop or vice versa. I think this is a mistake. The P-D-C-A cycle or loop is primarily an analytical approach that can be used with great success in a completely internal manner. One does not need to consult the external environment or adjust to unfolding circumstances to make the P-D-C-A loop work. P-D-C-A can be used with great success on the shop floor with the data that is available. Analysis which involves the use of a more or less complete data set to reach a conclusion. We use the data to make a decision about how to proceed, we than check and act to confirm or reject the hypothesis that our analysis has led us to. O-O-D-A is more concerned with synthesizing an action out of an incomplete data set. Since we can never recognize all of the variables that we are forced to deal with in any environment, we must be able to make a decision that we believe will give us the highest probability for success. The synthesis of an action from the observation and orientation of a complex and mysterious environment, subject to frequent and unpredictable change, is the essence of the O-O-D-A loop. My conclusion is that P-D-C-A is primarily involved with analysis perhaps using some synthesis and that O-O-D-A is primarily involved with synthesis using all of the analytical data points possible but considering that the data set will always be largely incomplete. Seen this way these tools can be used to great effect in a complementary manner. When involved with either creating a new organization or turning around and existing one, the first thing the CEO should do is to get with the COO and make sure that they are on the same page. It is advisable to make sure that the management team are supplied with five books; these are: Out of the Crisis by Deming, The Goal by Eliyahu Goldratt, Warfighting by the USMC, the Maneuver Warfare Handbook by Bill Lind, and Certain to Win by Chet Richards. While most Deming practitioners will be familiar with the first two books the other three may not be known at all. “Warfighting” sounds perhaps inappropriate, but it is really less of a book on actual small unit tactics or campaign logistics than it is a primer on leadership. I cannot recommend it highly enough. If one turns to page 29 of Warfighting, there is a simple Venn diagram that shows the three levels that are involved in conflict. I freely adapt this diagram to the basic organizational responsibilities in a business. 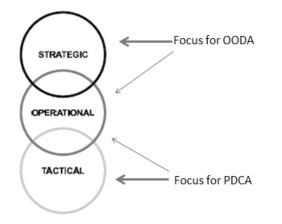 The strategic element is related mainly to policy objectives and directions and is therefore concerned with external unfolding circumstances and is the natural province of the OODA loop as policy objectives may change should the environment require a changing response. We never have all of the data we need to make a perfect decision and so we must synthesize responses using incomplete data. The tactical level involves the concepts and methods required to achieve a particular mission or result. In the business environment, this is the natural province of analysis and the PDCA loop. The tactical level uses the art and science needed to solve problems and uses the technical application of analytical tools such as control charts or Ishikawa diagrams to keep the PDCA loop churning. Therefore, while the OODA loop is best suited to keep the organization responsive and navigate the organization through the complex and non-linear business environment, the PDCA loop keeps the organization focused on addressing problems and keeps the team fit. While the CEO handles the strategic circle, the COO is working the tactical circle and together they should try and push the circles together using all of the tools at their disposal so that they achieve compression and overlap between strategic, operational, and tactical levels. Indeed the methods used by both Deming and Goldratt, including PDCA and Kaizen, may be thought of as the major part of an organizational fitness program. While using these tools, the organization is exercising; it is developing strength and endurance. It is cutting out fat and focusing on efficiency and optimal use of resources. However, even the fittest athlete needs a sensory apparatus to be able to navigate intelligently: A marathon runner without externally oriented senses, informing him or her of the position they are in will surely end up in the ditch rather quickly. Here is where the OODA loop makes its greatest contribution. By constant reference to the unfolding external circumstances and by intelligent course corrections, the business organization is in the best position to survive the vagaries of the ever changing environment. Thus, the intelligent use of the two approaches–the Deming based analytical methods and the Boyd based synthesis of the most appropriate course on which to embark–will yield a solution that considers both the state of the organization and its relative level of health as well as the position of the organization and its ability to adapt to the changes required in order to intelligently respond to unfolding external circumstances. It is interesting to note, in conclusion, that both Deming and Boyd insisted that the key to success was predicated upon unleashing the potential of people at all levels of the organization. This, I think is the key that binds the two systems and makes them necessarily compatible as well as eminently complementary. In other fora I’ve had something of kneejerk response associating PDCA with MBA programs. I was blamed for online computer conferencing on the IBM internal network (larger than the arpanet/internet from just about the beginning until sometime late 85 or early 86) in the late 70s & early 80s. One of the hot topics was MBA focus was destroying american business. There was a sense that it was possible to drop an MBA into situation they knew nothing about and the first thing they would do is create a plan (biasing me against anything that starts with a plan … implying possible to do a plan w/o any information or knowledge). In the early 80s, a co-worker got interested in Spinney’s TIME article and found Spinney’s number and called him up. Spinney told him he really needed to talk to John Boyd. That led to con’ing me into meeting John and sponsoring his briefings at IBM. One of the things that Boyd would refer to in briefings was that former military officers rising in the executive ranks were (also) corrupting corporate culture and destroying american business. and having equipment built by Mitsushita … and would go over and visit periodically. There was significant amount of technology transfer from consumer electronics back into high-end computer business (I would joke that I could get better technology in $300 cdrom player in Japan than I could get in a USA $10,000 high-speed computer modem; USA somewhat getting out of consumer electronics because of lower profit margins). Mitsushita was also proud of various efforts that they were doing with Toyota and wanted to show it all off. In the early 80s, there was article (WashDC post?) that called for 100% unearned profit tax on the US auto makers. The issue was that foreign import quotas were to significantly reduce competition allowing significiant increase in US auto maker profit that they were to use to completely remake themselves. However, they were just pocketing the money and continuing business as usual. 1990, US auto makers had the “C4 taskforce” to look at completely remaking themselves. Because they were planning on making heavy use of technology, technology vendors were invited to send representatives. At the meetings they could accurately describe how foreign makers had totally revamped auto industry and what US needed to do in order to compete. However, as can be seen, they still weren’t able to make the necessary changes. In the 90-91 time-frame, there was this whole thing with HDTV … that the US dept. of commerce was holding standards meetings … and there was constant effort to churn the standards. The fear was the lead that the foreign makers had in consumer electronics, they would also take over the HDTV market … and since HDTV required lots of high-end electronics, they would be able to leverage the volumes to move upstream and take over all the rest of the electronics industry … including high-end computers. The churn in standards was trying to give US companies competitive advantage. However, the foreign competition had advanced to a point where they could do automatic configuration to trivially handle nearly all of the standards churn. As it turned out, HDTV had long delay and there was the rise of the internet and personal computing (via silicon valley) that, at least temporarily, blunted those scenarios. In his “Cynefin Framework” for managing complexity, Dave Snowden emphasizes the difference between a complex domain, where cause and effect are not linked in a repeatable, predictable way, and complicated domain, where cause and effect are evident, at least to experts. In my view, OODA aligns best with the complex domain because its emphasis is on dealing with situations where the “enemy gets a vote” making them inherently unpredictable. OODA suits itself to how we interact with customers and competitors by allowing teams the common orientation to respond consistently–yet creatively to any situation that comes up. Stephen Bungay’s “Act of Action” gives several examples of this. PDCA aligns most directly to complicated domain situations, such as technical problems where experts can determine a repeatable cause and effect relationship based on experimentation. This is to say, yes, emphatically, BOTH are required where they are appropriate. so I would interpret that as polite way of saying starting planning w/o first understanding is because it is assumed to be the same as before … which i’ve seen in large beltway bandits teaching fresh graduates out of college a rigid formula process. Different circumstances require different approaches: where knowledge is more secure and the situation better understood, formal planning is the best approach. In complex situations, where the interactions with other parties lead to emergent results instead of predictable results, both Boyd and Snowden would suggest what Snowden calls “multiple safe to fail experiments”–in Boyd’s language this is iterating through the OODA loop. Neither OODA nor Snowden’s approach to complexity imply going into anything blind and ignorant, in fact, they both emphasize the unknowable and recommend approaches to dealing with uncertainty. And it is the knowledge of the interaction with other parties that gives you security, knowledge you don’t have with complex situations? The situation is better understood because, while the situation is complicated and may take time, the outcome is hardly ever in doubt? It just seems to me that is a strategy for failure. While formal planning may give you quicker transits, each transit, because you have an interaction with other parties, gives you less and less security and ultimately less understanding of the process. Unless you don’t believe there are interactions with other parties in complicated situations? I hope I haven’t introduced complexity in this conversation, because I am just trying to sort out the differences between complex and complicated environments. I have found two examples. One example is of a complex situation. The movements of a Rubik’s cube does not produce a complicated situation. At least it doesn’t look too complicated if you don’t look too closely at its structure. How it moves may be complicated, but the fact it is able to move in so many directions isn’t the focus of the situation. The focus of the situation is the patterns observed, and this is complex. Perhaps one needs only to observe a Rubik’s cube to understand this complexity. The other example is of a complicated situation. Simultaneous equations produce a complicated situation. The situation is not very complex. One just needs to keep a certain pattern in mind, and then make all equations fit the pattern observed. I am sure there are better examples, and would be open to suggestions. So, to “solve” the Rubik’s cube one needs to follow the disciples of Boyd, and their OODA loop. To solve simultaneous equations, one needs to follow the PDCA process. Even though I have never spent much time with one, I have never solved a Rubik’s cube. On the other hand, simultaneous equation aren’t that big a deal for me. So how would the OODA loop help me in the solving a Rubik’s cube? Is there something you need to know about me, as an operator in the environment observed, or is there a general theory you can use? I think we need to start with a better definition of the difference between “complex” and “complicated”. Rubik’s cube is complicated. I can use mathematics to calculate the number of combinations and odds of each move bringing me closer to the proper solution and by “doing the math” solve the puzzle correctly the first time. There’s more than one way, but the solution is knowable. “Complex” is a term that should be reserved for “emergent” situations where the reactions of the adversary change as a result of my actions. When you poke the system, the system changes. (The Rubik’s cube doesn’t change the color of its spots based on you have a good or bad move–hey, that’d be cool!) Chess is complex because the adversary changes the game. Now, because it’s a game, there are limits to its complexity and we’ve shown that a fast enough computer can start to make it complicated instead of complex–the computer can calculate all the possibilities and select the most probable outcomes. But in general, human vs human, it’s a complex situation. O-O-D-A loop applies because I have to adjust my moves based on the changes in the system (my adversaries moves). My own knowledge and experience (orientation) come into play in that a chess master has seen many of the system states before and intuitively knows the odds and which move is best. With a Rubik’s cube, I’m likely to have an algorithm developed from previous play, a sophisticated method of decision making,but in general, my approach does not change as a result of what the cube does. A master with observe the beginning state of the cube, plan an approach, execute and verify that execution as he goes–adjusting as needed. If he’s really good, the need for adjustment is negligible, but what you’re seeing is P-D-C-A. I’d point out that both of these approaches are borne of the scientific method and that there’s not a clean boundary between complex and complicated. It’s fuzzy–as the computer chess example illustrates. The Rubik’s cube also doesn’t follow a well defined path with each move it makes, only direction. Which, in the process of the game of chess, the path becomes more defined as the game continues. I mean after the first three moves, the computer most likely “knows” how the game will end. So chess is also complicated, and not necessarily a complex situation. In other words, in chess your opposition only moves in a complicated path that only needs to be defined and checked (PDCA) as the game progresses. Which as your comment seems also to suggest, why not use both methods, because it seems to me that complexity and complicated depends a lot on whose playing the game. Developing on the idea, one could say that the method of handling a situation depends on people, even if that persons is a machine. Which is to say whose in operations? My guess is that if there is a person in command and control of operations in the handling of the situations of a Rubik’s cube, the person first creates a “cheep trick” (glossary Tempo), which is strategy and puts the cube in the domain of complexity. To some degree, a situation that’s complex to an outsider, can seem complicated to an expert–that is a piece of it. (Chess is complex to most players because we have neither the processing speed and memory of a computer, nor intuition of a master–the number of permutations is beyond us). The point is to recognize which systems are emergent due to the influence of things out of your control and which systems are repeatably predictable. For predictable (complicated) systems, P-D-C-A applies. For emergent systems, O-O-D-A applies. We certainly agree on the fact that complicated systems are under our (self) control. I will have to think some more about the fact that emergent systems are not under our control. I admit we can’t command these systems to do any thing, but there seems to me to be a certain amount of control available. As something emerges, the outcome of the situation would depend greatly on how much history is gathered or a vision revealed. But then for that history/vision thing revelation, you would need a strategy and its use of a “Cheap Trick” for a vision-forming narrative. Which a vision-forming narrative would be a lot easier to understand, if the situation was just complicated. That said, it’s really no small wonder to me why “strategy” has become such a hot topic. Great post. I also believe that as one commenter suggested, both are required where they are appropriate. However, I don’t subscribe to the idea that the Shewhart/Deming PDCA cycle should only be used for complete, non-emergent and best/good use cases. Mike Rother, in his Toyota Kata, suggests that one of the ways Toyota was successful was their insight of using PDCA where there were unknown unknowns. He calls this the “Grey Zone” and describes how Toyota used small PDCA loop experiments continually moving towards a next target condition. I am also looking forward to reading Stephen Bungay’s Art of Action as suggested in this thread. Thanks — good observation, and entirely consistent with what Boyd was driving at in Conceptual Spiral. It’s worth noting that in a conflict, as contrasted with science / technology, a continuous series of rapid “hypothesis – test” loops also helps shape the environment (cf., Patterns 132). PDxA works great for software supply chain and some basic IT MTTR. OODA might be something useful for IT service incident resolution; however, I have not seen it used in practice for this. As well as Cynefin used for the same purpose. I might suggest reading John Allspaw’s thesis for approaching internet service incidents.